Japan’s Institute of Molecular Science (IMS) is dedicated to advance research in the molecular sciences—both theoretical and experimental. 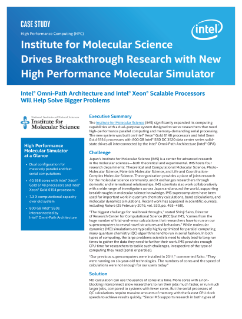 IMS hosts the High Performance Molecular Simulator, which supports both massively parallel operations and high-speed, memory-demanding serial computations including quantum chemistry calculations, band calculations, and molecular dynamics ...simulations. IMS significantly expanded its computing capabilities with a dual-purpose system designed to serve researchers that need high-performance parallel computing and memory-demanding serial processing. The new system was built on Intel® Xeon® Gold 6148 processors and Intel Xeon Gold 6154 processors with 800 GB Intel® SSD DC 3520 data center series solid-state drives all interconnected by the Intel® Omni-Path architecture.